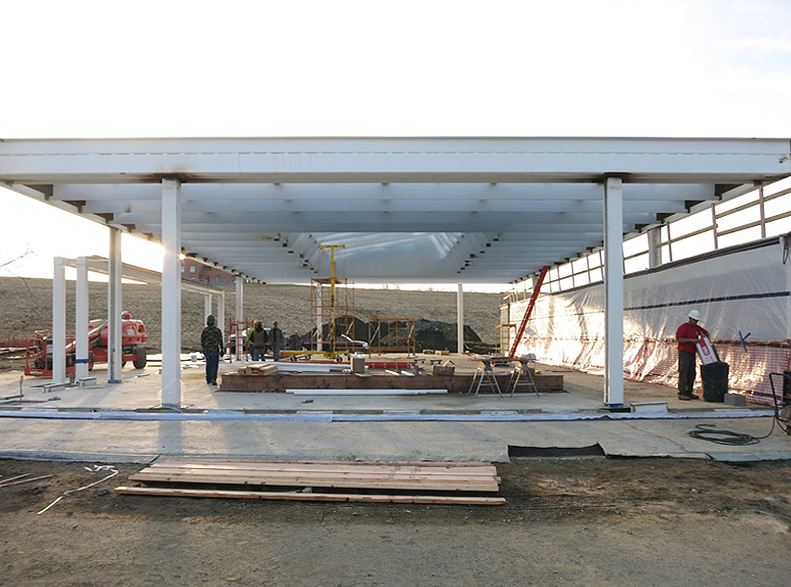 One of the dis­tinct fea­tures of the pool house will be the struc­tural steel roof system. 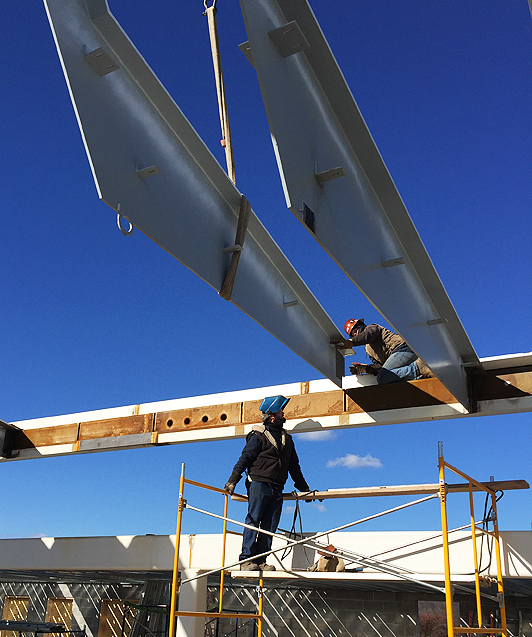 All the 16 steel T-shaped trusses that form the main roof are welded from 1-inch thick flat plate steel. After fab­ri­ca­tion, the trusses were deliv­ered to R.M. 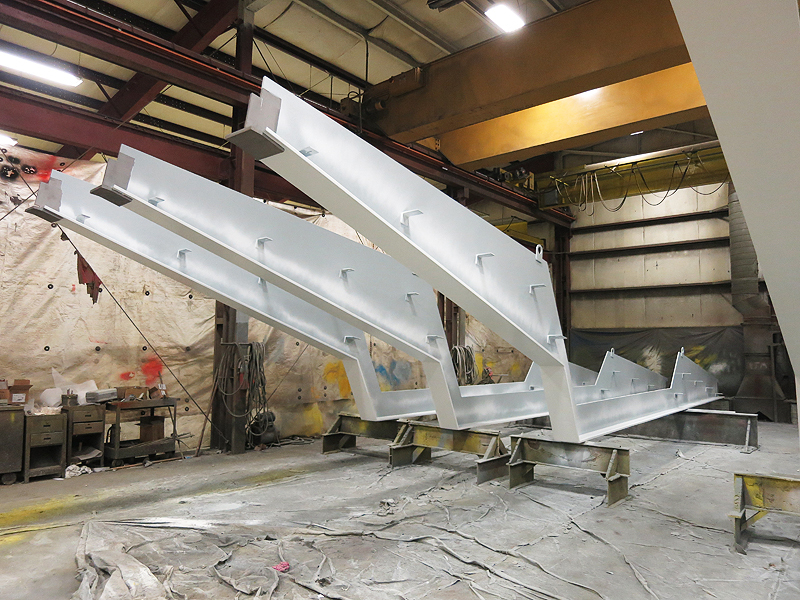 Lill, a metal paint spe­cialist to receive two coats of epoxy primer. This is where many of Calder’s sculp­tures were painted. 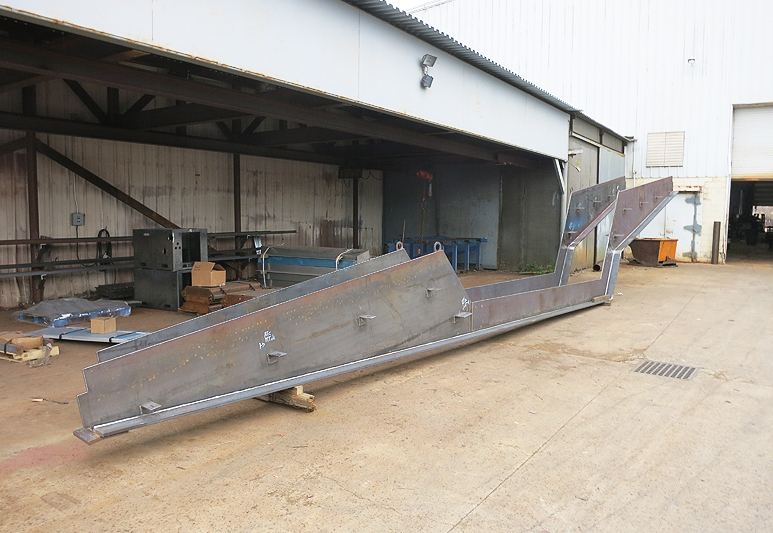 The steel perimeter box beam sup­ports all the trusses and in turn is sup­ported on 6 steel columns. Welder “squaring off” the mitered corner of steel box beam. Notice the tem­po­rary steel “clamp” welded to two sec­tions to keep them in posi­tion for filler weld. 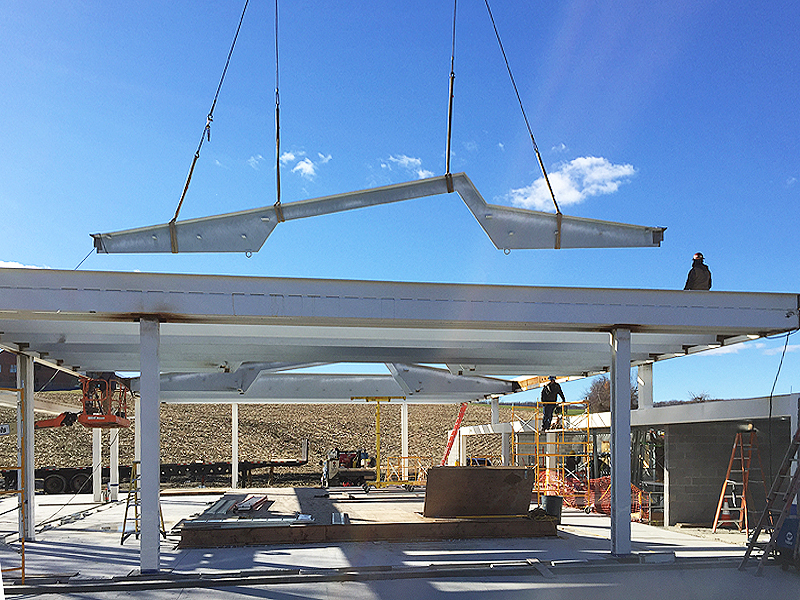 Trusses being hoisted into place with counter bal­ancing strap­ping. Each strap­ping con­fig­u­ra­tion had to find the center of gravity of the var­ious trusses. 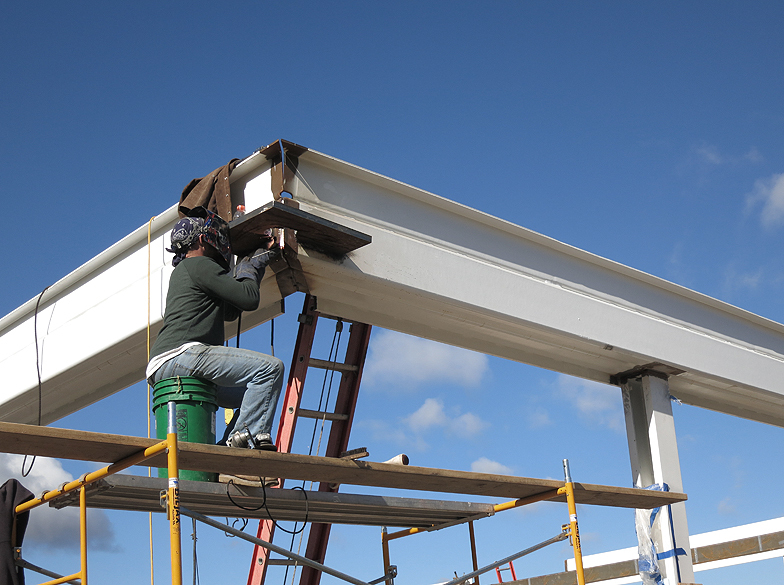 The box beams were slotted to received the ver­tical leg of the trusses. 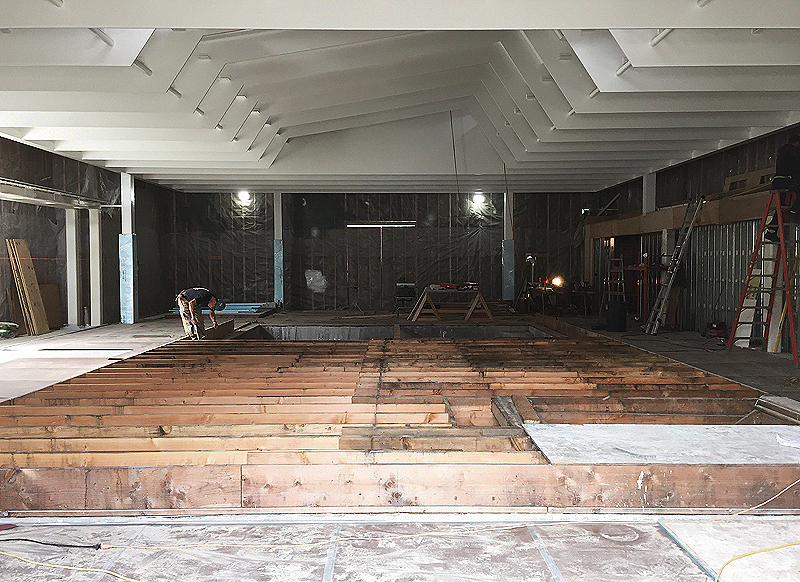 Once the trusses were in place and lev­eled, the slots were fill welded. 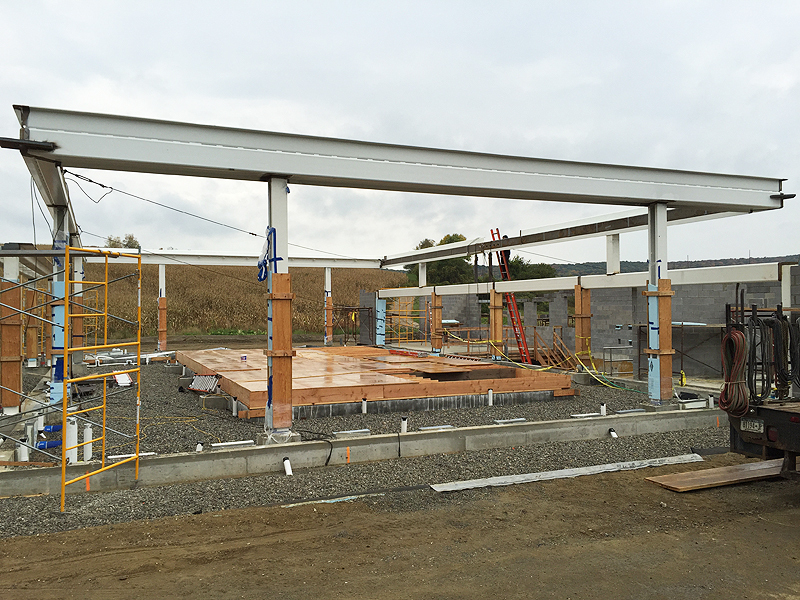 All trusses set in place and the tem­po­rary exte­rior enclo­sure being prepared. For gen­eral inquiries and new projects, please email info@wfora.com. For infor­ma­tion on jobs and intern­ships, email jobs@wfora.com with a cur­rent port­folio and CV. With the client, we set clear but flex­ible design guide­lines that con­trol deci­sions down to the details. This allows for progress with room for inspi­ra­tion. We design towards a client’s budget but con­stantly eval­uate whether addi­tional costs bring the client useful value. Our interest in sus­tain­able design is not only good for the envi­ron­ment but has proven to create better spaces for living in gen­eral. Simply, we build what we design. The process and results are better for everyone involved. John com­pleted his M Arch degree at Har­vard Uni­ver­sity and sub­se­quently worked for Pei, Cobb, Freed & Part­ners in NYC. He later joined HLW Int and became a Partner leading the design for many large projects both domes­ti­cally and abroad. In 2003, John estab­lished WFORA as a solo prac­tice with a single project, the MIG Offices, which was awarded a Design Merit by the AIA New York City Chapter in 2008. In 2008, John started Work­shop for Con­struc­tion (WFORC) to better con­trol the con­struc­tion of his designs. All projects by WFORA since then have been con­structed by WFORC. In 2010, he was an archi­tec­tural fellow at the Mac­Dowell Colony in New Ham­phire where he researched the metaphor­ical and phys­ical qual­i­ties of “sky­lights”. In 2016, John pur­sued his interest in sus­tain­able design and was cer­ti­fied by the Pas­sive House Insti­tute as a Pas­sive House Designer. John has served as Vis­iting Instructor at Pratt Insti­tute and teaches at the Bernard & Anne Spitzer School of Archi­tec­ture, CUNY. He con­tinues to serve on aca­d­emic juries at sev­eral archi­tec­ture schools.